While I’d never say no to a mini egg, my Easter dessert of choice nowadays doesn’t tend to involve chocolate. I’d rather something zesty and bright to sit (slightly) lighter in the stomach, something I can serve with fresh fruit, make well in advance and bring out the next day for any friends and family popping round over the holiday. 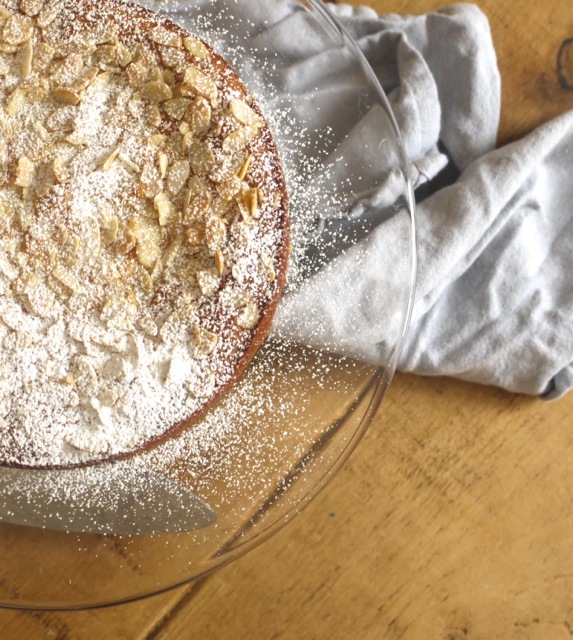 This flourless lemon, almond and ricotta cake fits that bill on all counts. I first got the notion to make this cake leafing through my copy of Green Kitchen Travels. Their beautiful Torta di Ricotta e Polenta reminded me of something I’d eaten at The River Café a while back and after some quick cookbook cross referencing, it appears the recipes are pretty similar (bar a substitution of honey for sugar). I’m sure their similarity is testament to this recipe’s authenticity – why deviate too far from an Italian classic when it’s so incredibly delicious? The recipe here, therefore, offers nothing entirely original. It’s more a tweaking of two recipes to incorporate the size of packets I found in the shops and my personal preferences (for lots of lemon and a little less sugar). This cake is fairly forgiving so if you can only find ricotta in 300g packs, use it all. If you’ve got a very sweet tooth, add 50g more sugar or if you’d like to try honey reduce the quantity to 150g. Just make sure you bake this cake sometime soon. It’s rich with ricotta, creamy but light with a crunchy almond topping and soft lemony middle. The perfect nod to the start of Spring. 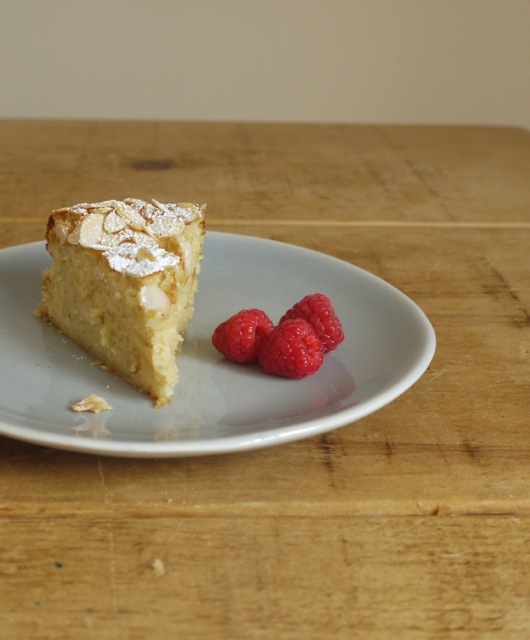 Light and zingy, this flourless lemon ricotta cake is naturally gluten free and makes for the perfect Easter dessert. It somehow tastes even more delicious the next day and is lovely chilled with a spoonful of fruit or compote. Preheat the oven to 160 degrees C fan. Lightly grease a 20cm round cake tin with butter and line the base with baking parchment. In a medium bowl, beat the butter and 150g sugar until light and fluffy, 2 - 3 minutes. Add the lemon zest and vanilla and beat again until combined. Add the egg yolks one at a time, beating well between each addition. Fold the ground almonds into the mixture, followed by the ricotta. In a separate bowl, whisk the egg whites until soft peaks form. Add the remaining 75g sugar and whisk until still peaks form. Fold a spoonful of whipped egg white into your almond mixture to loosen, then gently fold in the remaining egg whites until you have a smooth batter. Scrape the batter into your prepared tin, sprinkle over the flaked almonds then bake for 40 - 50 minutes or until firm and golden round the edges. The cake may have a slight wobble in the middle but will firm up once cooled. Remove from the oven and allow to cool completely in the tin before transferring to a serving plate and dusting with icing sugar. Serve in thick slices with cream and a handful of raspberries, if you like. The cake will keep in an airtight container for several days and is also delicious chilled. Kate this looks incredible! I can’t wait to try it out! 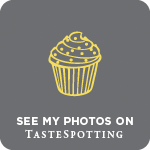 Also your food photography is beautiful, I’m so excited for your recipe book! Will definetly be making this, as I need a dessert to take to my daughters this Easter and have been looking for something to make the day before. 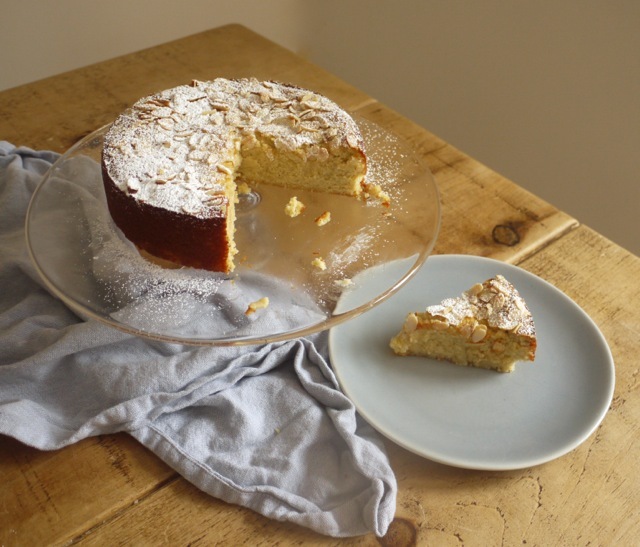 such a stunner of a cake – ricotta makes cakes so very good. 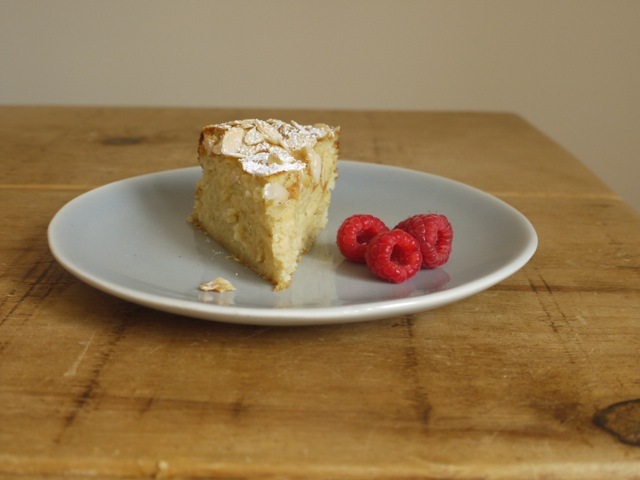 Gorgeous – it looks beautifully light and I always appreciate the use and flavour of almonds in cake. This looks lovely! I’m definitely going to try this this weekend for Easter dinner. I have one question – by ‘ground almonds’ do you mean almond flour? I’m assuming so, but just want to check! Oh mini eggs. I have a serious problem with them. I have to hide the bag in my car. Yeah. I know. This cake though. I just love it. So elegant and perfect for Easter! Looks absolutely delicious. I’ll definitely be making this at Easter. Ooooh, this looks lovely! And just the kind of thing I’m in the mood for these days. I’m bookmarking this cake for our Easter staycation – seems it would be just perfect! This cake is just perfect. I too feel the need for something a bit lighter and fresher at this time of year and I can never turn down a flourless cake! Given my recent baking tendencies, I will definitely try this. Happy Easter and spring! What a gorgeous cake Kate! I love tart lemon cakes, and like you, often reduce the sugar to emphasise that. Sadly my days of dairy are behind me now, but I think I’ll be dreaming of this cake for a while. Just gorgeous! Almond cakes are so decadent! I love that this is flourless too. I know someone who would LOVE this cake so I can’t wait to try ti! I was so inspired by your recipe that I have adapted it to include ground walnuts and ewe’s milk yoghurt. It’s on my blog. Hope you don’t mind! This is the perfect time of year for a lighter cake such as this one. It sounds heavenly. My daughter made it for us for easter. Superb !!! This was very easy to make and even easier to eat. And it tasted even better the next day! Ver very nice. Yum! I have to confess that I followed the recipe BUT doubled the ricotta and it still is moorish, and tastes just right. Great cake for Christmas time!! This is what I’ve been looking for.. can I use 22cm pan instead? Or should I adjust the ingredients’s amount? I recently followed your recipe and brought this to a Passover Seder. I made it a second time because it was so good and now have a third one in the oven to bring for someone’s birthday. For #2 and 3 I used a sugar substitute (stevia and erythritol) as my partner and his mother are diabetic. Flourless is great for that and for the gluten free people in my life as well. Great recipe, great instructions, delicious! Everyone has loved it! I have made this cake about 4 times now. Absolutely delicious. Thank you Kate for sharing the recipe. i baked this recently and it was truly delicious! thanks for sharing this excellent recipe. its the first cake i have ever made from scratch and now im keen to try more. This cake turned out beautifully! Moist tender crumb, and rich, bold flavour. Adding it to my repoitoire! Willing surely make over and over again. Hi, the cake has all the ingredients that my daughter love and she asked me if I can make it for her 1st Communion. Can I bake it a 1 or 2 days before? can I use frosting? I am not sure what frosting will go with polenta .We dont like fondant but a friend said a very fine fondant for the decoration if possible. May I please have your advise? I’m baking it now and just realized that there’s no baking powder. So am I right? How lemony is this cake? Would lemon curd on the side be too much? Or would a berry compote be nicer? Yes, it should be fine to freeze. Perfection! So delicious and easy to make. Thanks for the recipe. 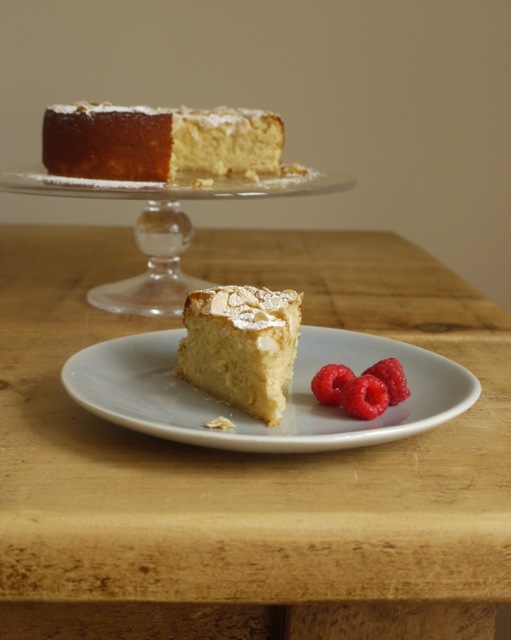 Could you please convert the Lemon-Ricotta Cake recipe to Imperial for U.S. baking. Thank you. Yes, please convert this recipe for US baking so I don’t mess it up! This sounds perfect for my daughters 45th birthday dessert!!! I had an authentic Italian lemon ricotta cake that I wanted to make but thus is much healthier! Perfect! Thank you! !